They say what you look for in real estate is location, location, location. That's very often a factor in the success of a supermarket. For instance, the Elizabeth, NJ Pathmark only stayed open as long as it did because it was centrally located. The Fresh Market in Livingston, NJ failed after only three years because its location was out of the way and invisible for many people. 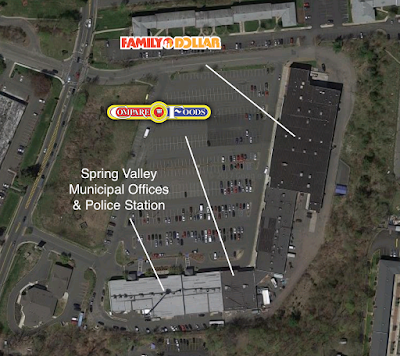 Compare Foods' location here in Spring Valley is at best . . . questionable. So many Compare Foods (and similar stores) are centrally located in busy neighborhoods, on main streets. 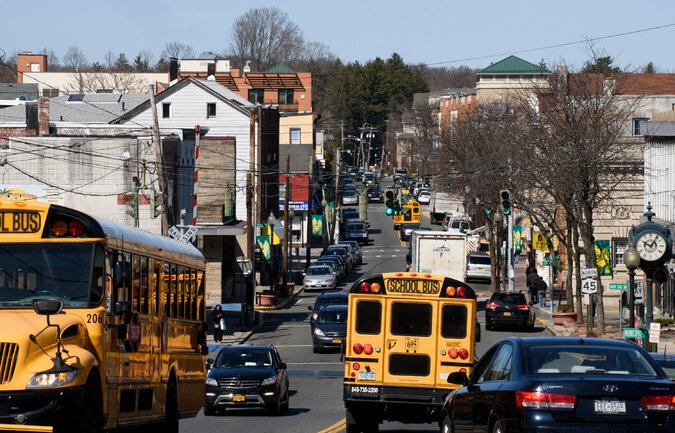 Spring Valley, NY has a bustling main street and a major retail corridor. Yet Compare Foods is located on neither of these. It's a few minutes' drive north of downtown on Main St. in the corner of a mall whose other tenants include Family Dollar and . . .
. . . that's right, the city hall and police station, in a strip mall! I've seen that before, and it's kind of strange if you ask me. Obviously this mall was built with a department store anchor that has been subdivided into other stores including Family Dollar, and the Compare Foods and some or all of the offices would have been a supermarket, most likely. Compare Foods today is very small. It's a pretty new store though, and it's really nice. The problem is not only is it not in a busy area, it's in the back corner of a mall you can't even really see from the main street (Main St, to the far left in the picture above). Anyway, let's head inside! You enter to a double-wide produce aisle with refrigerator cases along the left wall and grocery shelving on the right side. Along the back wall is a large hot food area, fresh service seafood, and service meat. It's surprising that such a small store would have such deluxe services like hot food and seafood. 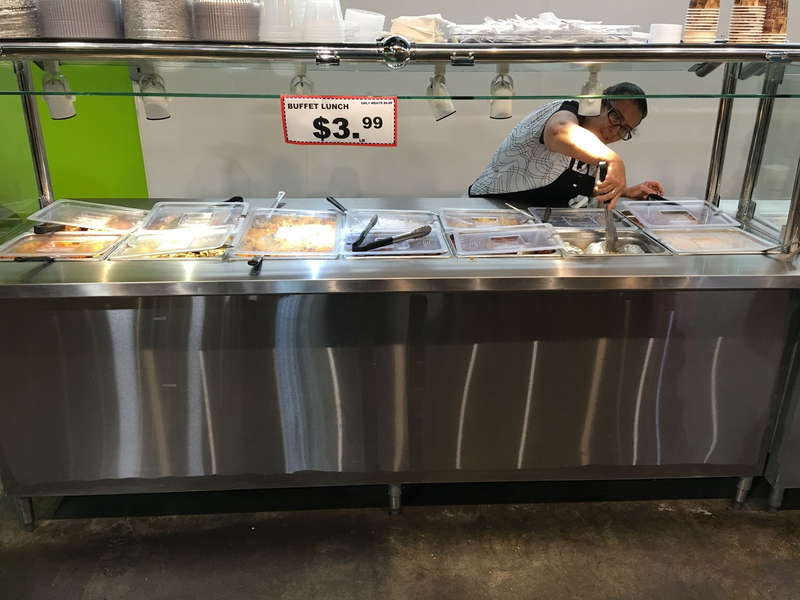 A photo from the store's Facebook page showing the hot food bar. Notice the compact shelving and how there is no wasted space anywhere. Dairy and meats are in the last aisle. Looking towards service meat in the back. Frozen takes up half of the second-to-last aisle. When regular white bread won't do . . . This is one of the few products under the Compare Foods brand. The rest are generally under the White Rose or Super A/Avenue A brands. I like this cart corral's design. The photos are really eye-catching. This Compare Foods was surprisingly good. It's very small but very compact, and with full service deli/hot foods, meat, and seafood, it's a good local market. It's also very nice with high ceilings and polished concrete floors. "The new Waldbaum’s was probably triple the size of the old store and really a beautiful store. 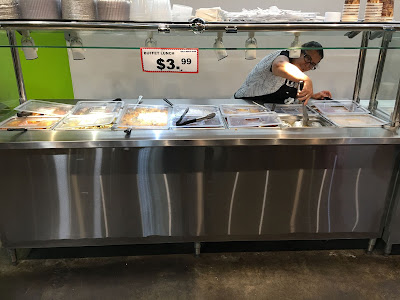 But Waldbaum’s made a major miscalculation: The new store sat at the foot of a neighborhood called The Hill, which was widely perceived in the local community as dangerous and crime-ridden, and many former customers of the old store wouldn’t make the switch to the new store. That fear, combined with poor access and visibility in the new shopping center and the opening of a new ShopRite in Spring Valley led to the new Waldbaum’s to close quite quickly, and the store was vacant for probably 15 years until Family Dollar took the space." There’s an interesting history to this shopping center. It was built in the mid-1980s and anchored by a Waldbaum’s supermarket in the space that Family Dollar now partially occupies. The Waldbaum’s was a replacement for a much smaller 1960s-era location just up the road in the Hillcrest Shopping Center (now 99 Cent Outlet, previously National Wholesale Liquidators). The old Waldbaum’s wasn’t huge, but it was always very busy, even though there was a Grand Union almost next door (now a Bravo). The new Waldbaum’s was probably triple the size of the old store and really a beautiful store. But Waldbaum’s made a major miscalculation: The new store sat at the foot of a neighborhood called The Hill, which was widely perceived in the local community as dangerous and crime-ridden, and many former customers of the old store wouldn’t make the switch to the new store. That fear, combined with poor access and visibility in the new shopping center and the opening of a new ShopRite in Spring Valley led to the new Waldbaum’s to close quite quickly, and the store was vacant for probably 15 years until Family Dollar took the space. Thanks for the history! I'm surprised the Family Dollar space was a supermarket, it seemed really large for a supermarket of that era. But I guess I did also estimate the shopping center was older than it actually is. Was the Spring Valley ShopRite at 14 Spring Valley Marketplace, where Michael's is now? I came across that address, and it definitely looks like an old supermarket. Pictures and a tour of the Bravo are going up tomorrow!